This shop has been compensated by Collective Bias, Inc. and its advertiser. All opinions are mine alone. 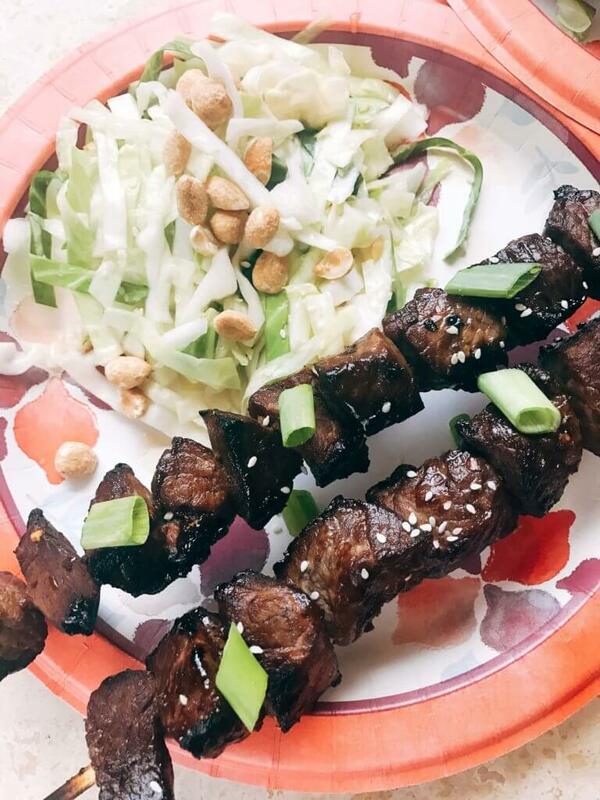 #SummerSoStrong #CollectiveBias I am in LOVE with these Asian Steak Skewers with Peanut Slaw! This marinade is based on a rib recipe that my mom uses, but ribs can be tedious to make. 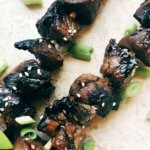 These steak skewers are much easier and faster with all of the same great flavors. When we are entertaining, I look for easy options. The last thing I want to do after a long night of hosting is was a ton of dishes. I know you know what I am talking about! These Dixie Ultra® plates really are like magic. We went camping recently with the traditional paper plate and it was just a mess with everything soaking through and the plates coming apart. But these plates are the exact opposite! They are stress tested (which means less stress at dinner), are so strong, and no bending or flexing as they hold up to two pounds of food. They are also cut resistant so no need to worry about them shredding. And my favorite thing is that these Dixie Ultra® plates are recyclable. Perfect for a quick and easy cleanup without stacks and stacks of dishes waiting for their turn in the dishwasher. Less time cleaning, more time relaxing with friends and family. I am loving these designs, they are perfect for summer! 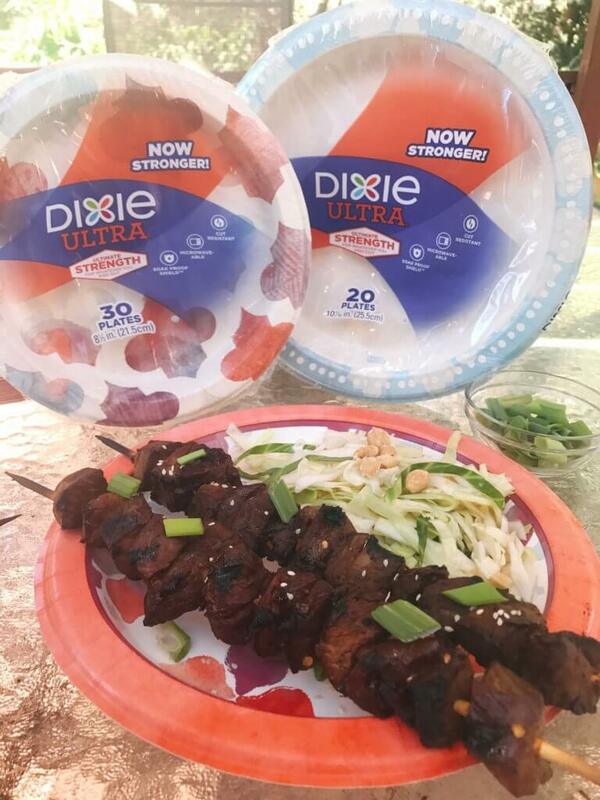 And you can only find these exclusive co-create Dixie Ultra® plates at your local Target. I know I am there rather frequently (possibly too frequently according to the hubby, but is there really such a thing??). Grab some of these fun new designed the next time you are there for your heavy, messy meals and you will be able to rock that white summer outfit knowing that these plates are so strong. 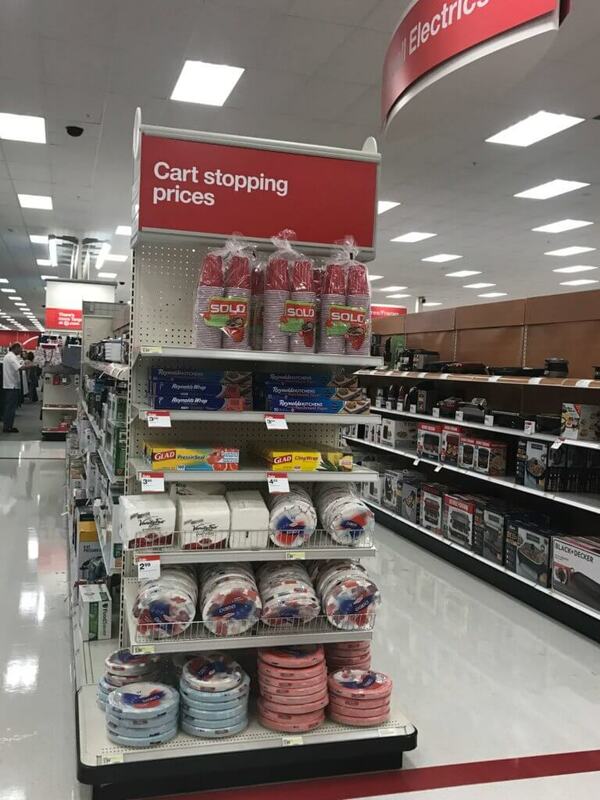 You can also go shopping for these plates in the image below and pick them up at the store. Save 25% on Dixie Ultra via Cartwheel from 6/18-7/1/17! 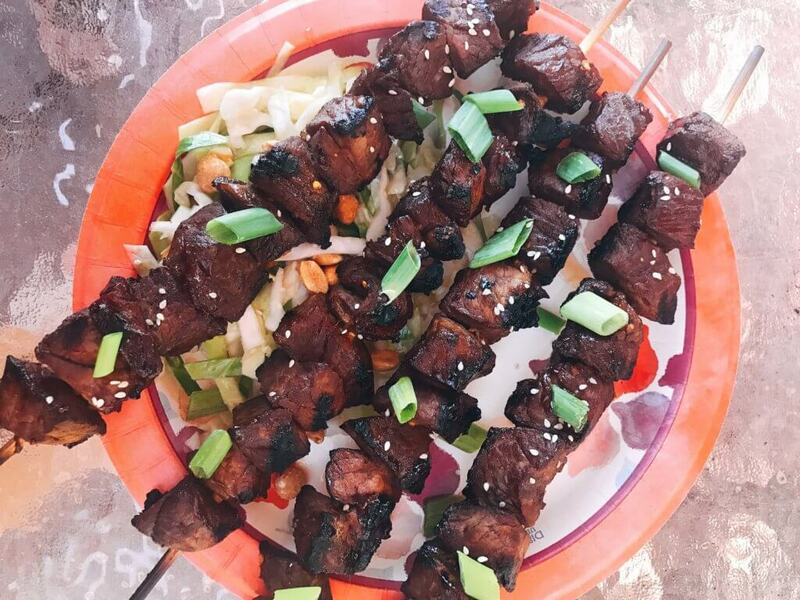 These Asian Steak Skewers with Peanut Slaw are just as easy as any other skewer or kebab. First combine all of your marinade ingredients in a large bowl and whisk together. Then cut up your steak into desired chunk size (I aim a little smaller, at 1 to 1.5″ pieces). Put the steak in the marinade, toss to coat, and let it sit for at least one hour. When the steak is marinating I like to make the slaw. Thinly slice the cabbage and place in a large bowl. 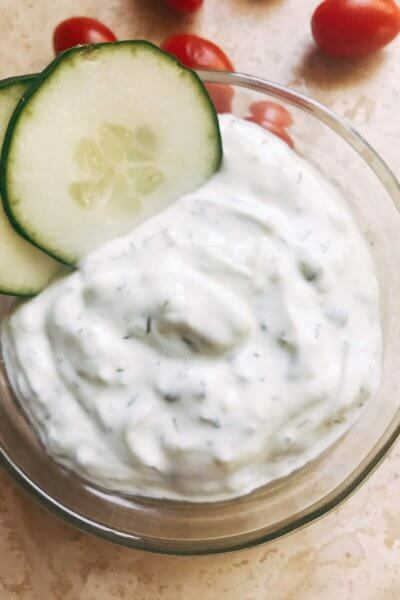 Combine all of the other ingredients, whisk together, and toss with the slaw. Refrigerate until you are ready to use. That’s it! 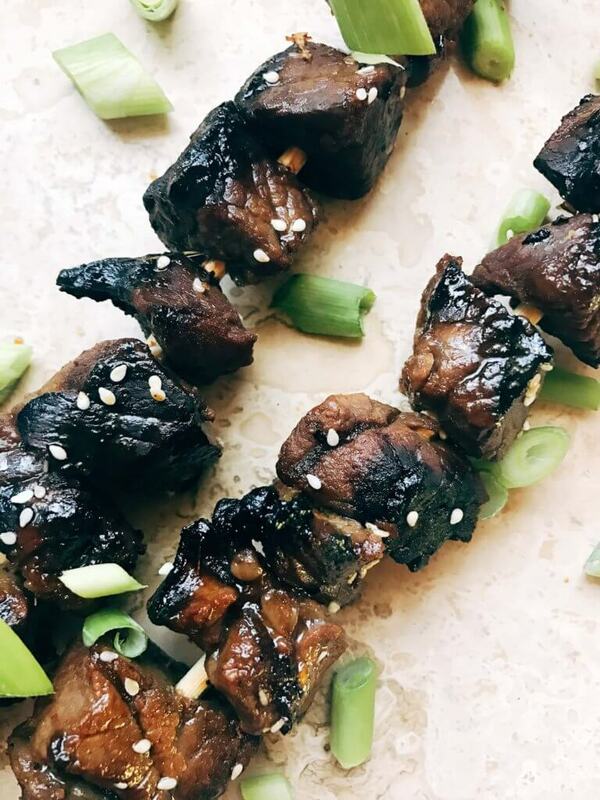 When you are ready, slide the steak pieces onto your skewers. You can get approximately 1/2 pound on each skewer as shown. Heat up your grill and get grilling! The exact time it takes to cook will depend on your exact grill’s heat, the size of the pieces, and your desired doneness. 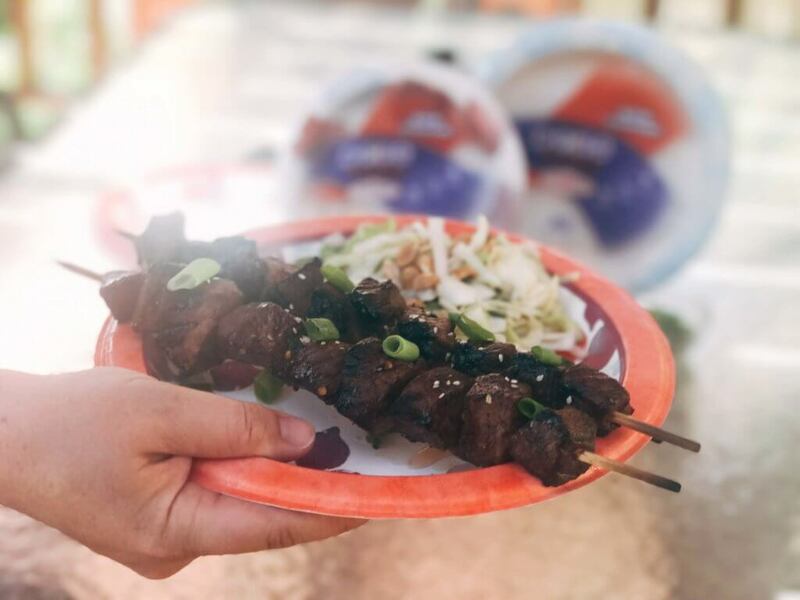 I am so in love with these Asian Steak Skewers with Peanut Slaw, they will be making a regular appearance this summer! 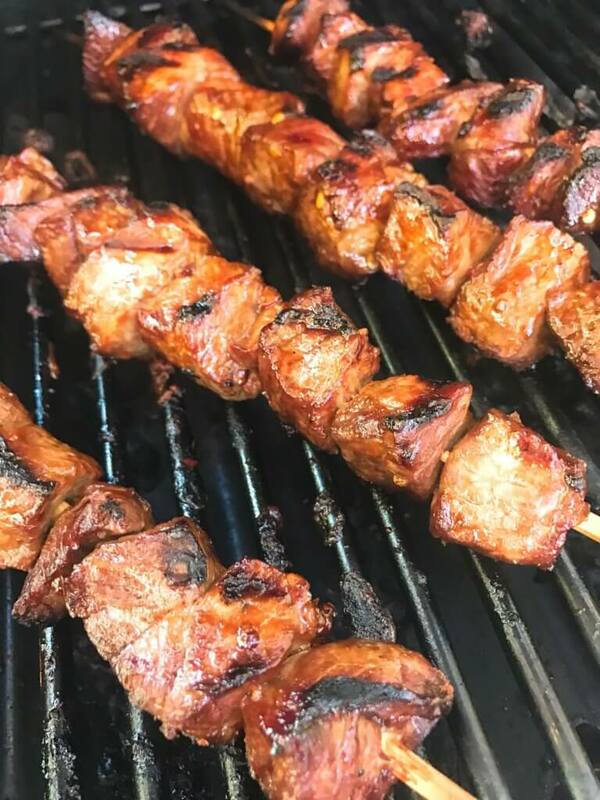 Do you have a favorite go-to kebab recipe? 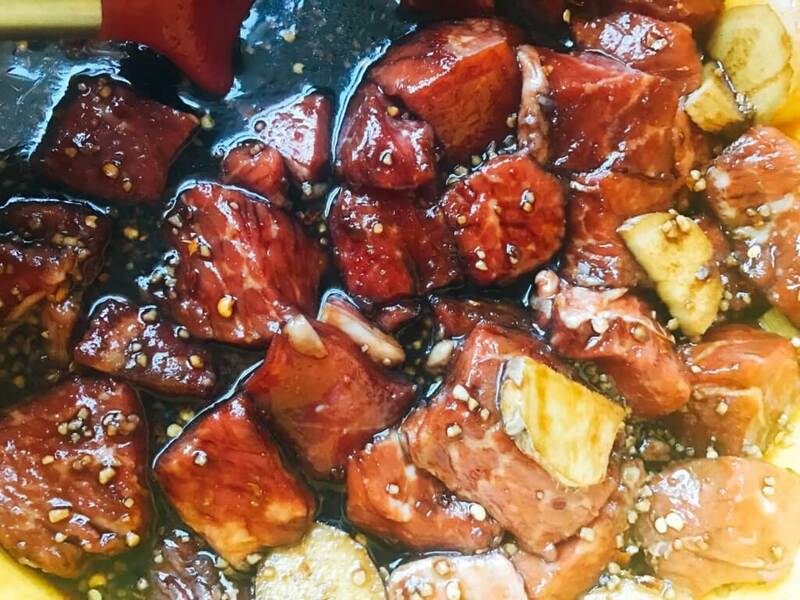 In a large bowl, combine the soy sauce, brown sugar, ginger slices, garlic, sesame oil, juice of 1 lime, and red pepper flakes. Stir to combine. Cut the steak into 1-1.5" chunks. Add to the marinade and toss to coat. Marinade for at least one hour. While the steak is marinating, make the slaw. 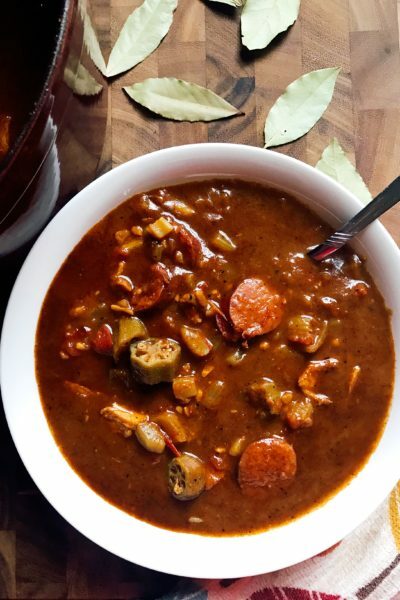 In a large bowl, combine all of the ingredients except the cabbage and whisk together. Season to taste with salt and sriracha. Slice the cabbage thinly to a shredded consistency. Add to the slaw sauce and toss to coat. Refrigerate until ready to serve. When the steak is done marinating, thread the pieces onto skewers (do not use the ginger slices). I fit approximately 1/2 pound on each skewer, 4 skewers. Grill over medium heat until you reach your desired doneness. The time this takes will depend on the size of the steak pieces as well as the exact temperature of your grill. For medium, this took us approximately 3 minutes per side. Serve immediately with the slaw. Garnish with sesame seeds and sliced green onion if desired. The time this takes to grill will depend on the size of the steak pieces as well as the exact temperature of your grill. For medium, this took us approximately 3 minutes per side. 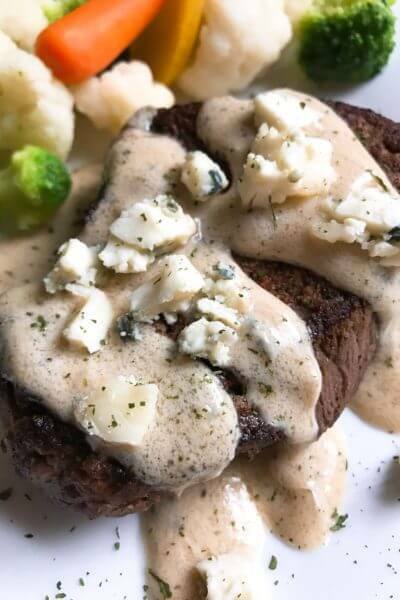 The steak can marinade longer than one hour, just make sure you have it in the refrigerator. There is sugar in the marinade, which can burn on the grill, so it is best to not turn the heat up too high. Wow! 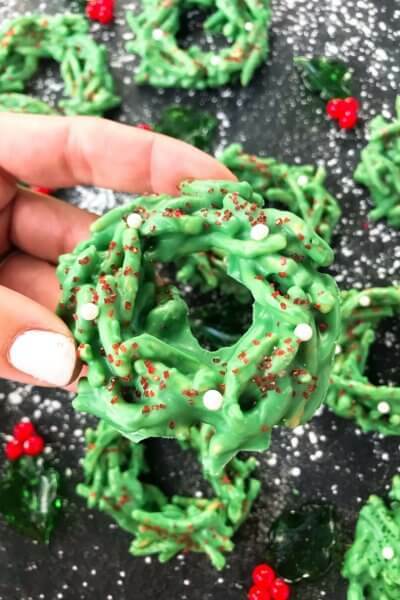 Such a great party idea! 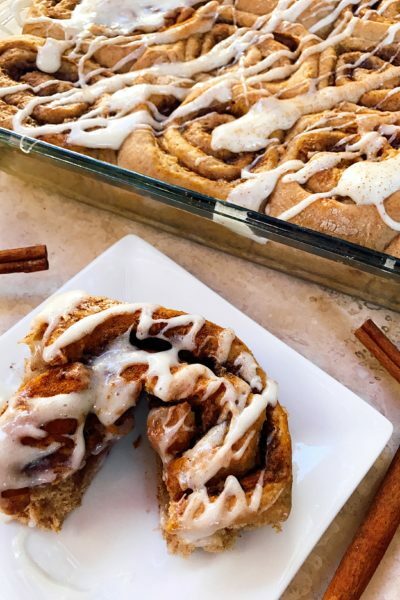 Thanks for the awesome recipe, Kim!